Proudly partnered with Midwest Physical Therapy, we are committed to providing the best on-site physical therapy experience. To learn more about Midwest Physical Therapy please visit their website. Our therapists use hands-on techniques that facilitate pain relief and deliver responsive results to our patients rehabilitation. 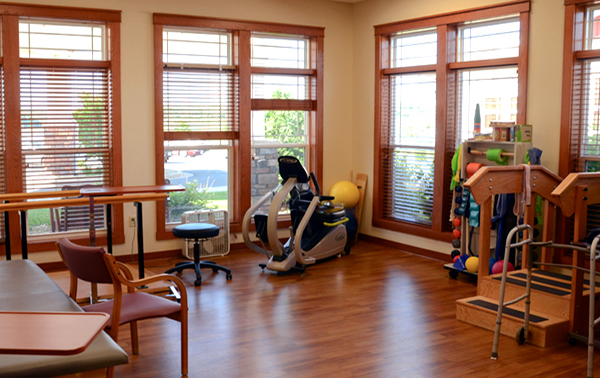 They customize the rehabilitation programs to meet each patient’s individual needs. Additionally, our therapeutic exercise and home programs will help get you back to where you want to be. Physical, Occupational, and Speech Therapy are available 7 days a week– including lymphedema therapy, traction therapy, ultrasound, electro-stimulation and restorative program development. Our services are also available to non-residents of our facility. Community members can complete their therapy close to home at our location. Please contact us, if you would like more information about this option. Spring Valley Senior Living and Health Care Campus.